Eating vegan when you’re traveling might seem daunting at first, but with a little bit of planning it’s easy as pie! Or at least as easy as purse cashews. The holidays are here! If you’re planning to travel, eating vegan while you’re road tripping might seem a little bit tricky. I wanted to share some of the tricks that have helped me eat well even when I’m in a not-so-veg-friendly location, and I hope that you’ll share your vegan travel strategies in the comments! Depending on how you’re traveling, you’ll use different strategies to help with eating vegan on the road. If you’re in a car, you can usually bring more food than if you’re taking the train or flying. And of course when you fly you need to stick to packing dry snacks that can get past security. If you’re driving or taking the train, you can bring a little cooler with road snacks. Pack a grain salad packed with beans and veggies to munch on, sandwiches, and of course don’t forget the finger foods. If you pack strategically, you can just eat at rest stop picnic areas and never set foot in a fast food place. The best part? You’ll save travel time with quicker stops! 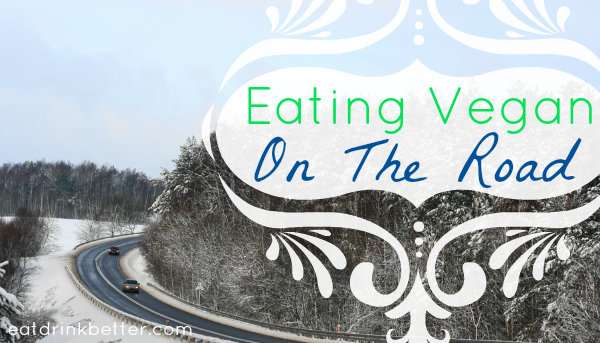 A good selection of snacks makes eating vegan when you’re traveling easy and delicious! I mentioned purse cashews above, and that was no joke. I always keep a bag of roasted, unsalted cashews on me. Kale chips, carrot sticks, vegan jerky, dried fruit, energy bars and any other finger food you like all make great rations, and most of them are fine to bring on the plane. In addition to the cooler, I like to have some extra snacks for longer road trips, because I get bored and munchy in the car. The food bag is really just a place to store extra purse snacks. The bonus? Whatever you don’t eat on the road can supplement you at your destination, if you’re headed to a place that isn’t super vegan friendly. Once you get to your destination, you’ll want to suss out your food options. This list includes the places that I tend to look for, and I’d love to hear about your favorite vegan food that’s available at most destinations. Find a grocery store – a health food store is even better – and stock up on snacks! Check Happy Cow for veg- and veg-friendly restaurants. You might be surprised at your options! Southwest and Mexican food tends to have good vegan options. Just make sure you ask if there are meat or dairy in the beans, rice, or guacamole. When in doubt, Chipotle isn’t a bad option. Ruby Tuesday – I know, it’s probably not your first choice, but they have a huge salad bar. If you’re stuck in the ‘burbs, I bet you can track down a Ruby Tuesday. Just have your bag of vegan tricks (see the list below!) ready to spice things up. Sandwich shops – Right, so I know you probably aren’t all, “Ooh! Wilted lettuce on bread!” but a veggie sandwich sure beats starving! Just make sure you ask if there is egg or dairy in the bread, and keep an eye out for honey in any dressing they put onto your sandwich. Asian Food – Panda Express, anyone? Even in the most meat-happy place, you can usually find General Tso’s Tofu or steamed veggies and white rice. purse cashews – I know, I’ve mentioned this a couple of time. Don’t leave home without a big bag of cashews or your favorite nuts! 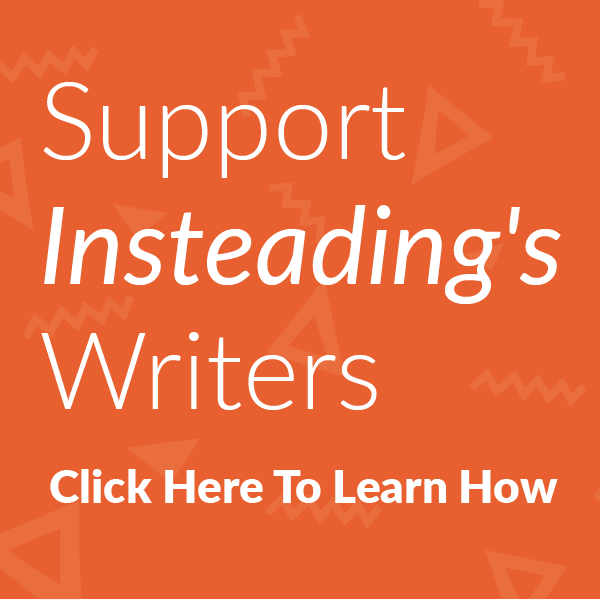 nutritional yeast – Take THAT boring salad! In your FACE, plain potato! coconut bacon – Even the most boring vegan menu items are delicious when you sprinkle on some smoky coconut bacon. I usually go for this one from Phoney Baloney’s. You can also phone ahead. This is a trick I learned from Vegan Miam. If you’re staying in a nicer hotel, they’ll often accommodate you if you call and let them know that you have a special diet. It’s worth a shot, right? Next article Healthy Foods: Eat More Nuts!